Approximately 80 scientists, humanitarian workers and funding organisations met at the 'DLR Humanitarian Technology Days 2019' in Oberpfaffenhofen. The goal is to make humanitarian work in crisis and disaster zones as effective as possible using the latest technologies. 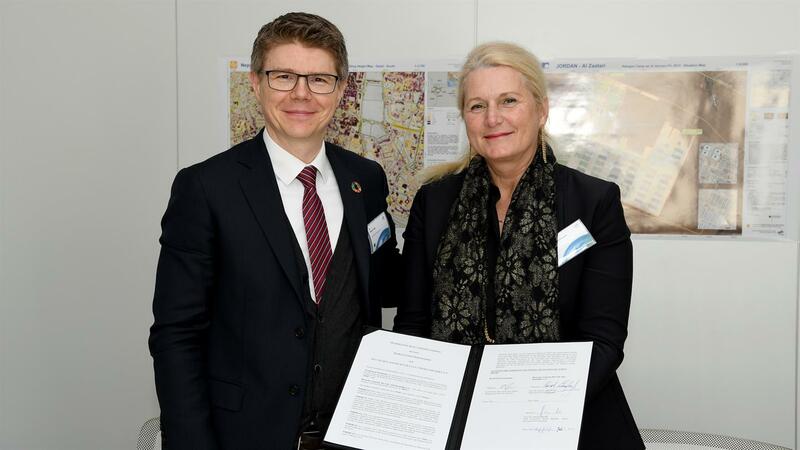 The Memorandum of Understanding between DLR and the United Nations World Food Programme (WFP) ensures long-term cooperation in the fight against global hunger. The signing ceremony took place on 6 February 2019 at the ‘DLR Humanitarian Technology Days’ in Oberpfaffenhofen. Image (from left): Robert Opp, Director of the Innovation and Change Management Division at the WFP; Pascale Ehrenfreund, Chair of the DLR Executive Board; Stefan Dech, Director of the German Remote Sensing Data Center at DLR. The United Nations World Food Programme (WFP) is intensifying its cooperation with the agreement signed on 6 February 2019. Innovative technologies and projects will be jointly developed and implemented for the ‘Zero Hunger’ mission. The goal is to defeat global hunger by 2030. Image: Robert Opp, Director of the Innovation and Change Management Division at the WFP with Pascale Ehrenfreund, Chair of the DLR Executive Board. Humanitarian aid organisations are increasingly seeking technological support for their work in crisis and disaster situations. New technologies from fields such as satellite remote sensing, robotics and communications can assist aid workers in rescuing and caring for people as effectively as possible in emergency situations. This is especially applicable for operations conducted under extreme conditions. In order to develop solutions cooperatively, the German Aerospace Center (Deutsches Zentrum für Luft- und Raumfahrt; DLR) has launched a special event. 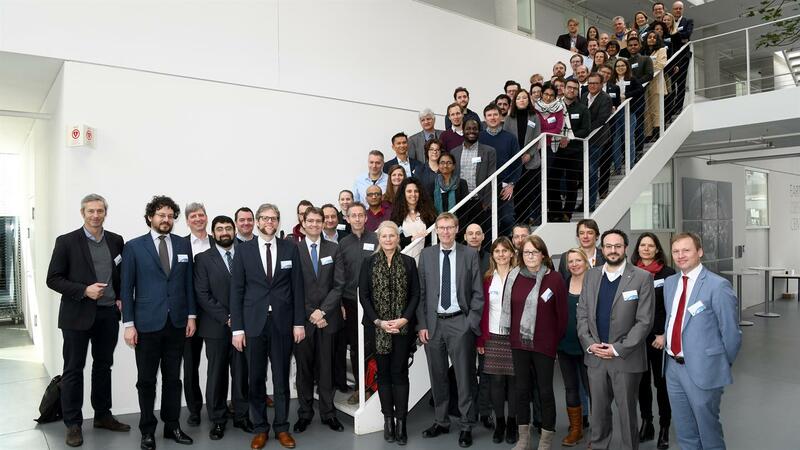 Approximately 80 scientists, humanitarian workers and funding organisations are participating in the DLR Humanitarian Technology Days', which are taking place on 6 and 7 February 2019 in Oberpfaffenhofen. "DLR takes its societal responsibilities very seriously and supports much-needed humanitarian endeavours across the globe. Applied research and technological developments help to alleviate suffering. In terms of practical humanitarian aid, DLR is able to make extensive use of its expertise in the fields of space, aeronautics, energy, transport, security and digitalisation. This can only be accomplished through close dialogue and cooperation with those involved in humanitarian aid, and this event is an important contribution to this," said Pascale Ehrenfreund, Chair of the DLR Executive Board, at the launch of the Humanitarian Technology Days. Stefan Dech, Director of the German Remote Sensing Data Center, also welcomed the participants. Those in attendance include representatives from the United Nations (UN), with delegates from the UN Platform for Space-based Information for Disaster Management and Emergency Response (UN-SPIDER), the UN Office for Outer Space Affairs (UNOOSA) and the UN World Food Programme (WFP). There were also participants from the German Foreign Office, the German Society for International Cooperation, the German Federal Agency for Technical Relief, the Red Cross and eight international non-governmental organisations. DLR is presenting its expertise across all of its areas of research at the Humanitarian Technology Days. The two-day 'matchmaking' exercise allows decision-makers, those who implement solutions, and developers to exchange ideas and experiences; this can create the basis for long-term partnerships and generate ideas for future projects. The use of high-tech solutions in humanitarian aid is still a relatively young field of research and development, with DLR among its pioneers. The German Remote Sensing Data Center, in particular, has many years of experience in the field of disaster management and civil protection. Today, it is increasingly important for aid organisations to be able to act proactively, recognising crisis situations at an early stage and using their knowledge of risks to implement preventive measures. The latest generation of Earth observation satellites provide valuable data that can be collected and processed by DLR for that specific purpose. To give one example, experts are able to map recurring crises such as droughts or flooding in order to produce food security forecasts. DLR can also support humanitarian efforts in many other areas. Potential applications for its technological expertise range from human and materials logistics through to semi-autonomous aid missions, dealing with the causes and consequences of climate change, addressing the root causes of migration by means of development and aid in the field, and decentralised energy supply to refugee camps or SOS Children’s Villages in crisis zones. DLR has been working with the WFP for a number of years on various projects. The partners are now set to intensify their successful cooperative efforts. During the Humanitarian Technology Days, the partners have signed an agreement to develop and implement technologies for the 'Zero Hunger' mission. "The WFP has a very important mandate – to fight against hunger worldwide. The Memorandum of Understanding ensures long-term cooperation in order to make most effective use of the latest research findings and technological developments from all areas of DLR research in the fight against hunger. This can only be achieved effectively through implementation partners such as the WFP," explained Professor Ehrenfreund. "821 million people have to go to sleep hungry every night. In the face of conflicts and natural disasters, we need new approaches and technologies to help these hungry families more quickly and more sustainably in the future. Partners like DLR are particularly important and we look forward to the innovative, creative solutions that DLR and our Innovation Accelerator will jointly develop," said Robert Opp, Director of the Innovation and Change Management Division at the WFP. The purpose of the agreement is to develop and implement key technologies in order to defeat global hunger by 2030. Innovations from space, aeronautics, energy, transport, digitalisation and security will be utilised. Another area of focus is establishing a common 'Thought Leadership' to connect research and development activities with the development of new, future-oriented projects.